CANNES, France—Nike and R/GA are going to have to build a new gadget just to keep track of their advertising awards. The pair were awarded the coveted Titanium Grand Prix at the Cannes Lions festival here tonight for Nike+ FuelBand, the accelerometer you wear on your wrist that tracks your activity and energy expenditures and translates them into "Nike Fuel." They had already won a Cyber Grand Prix earlier this week for FuelBand. The win echoes 2007, when they also reeled in Titanium and Cyber Grand Prix awards for the original Nike+ Running system. 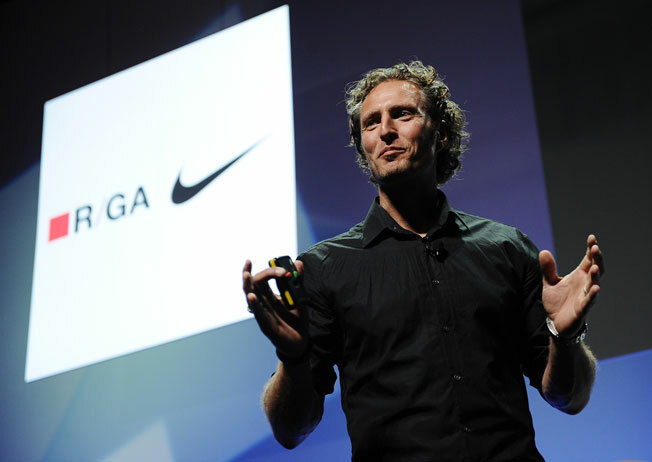 Nike's vp of digital sport, Stefan Olander, and R/GA CEO Bob Greenberg showed off the product, and spoke of its development, at a packed seminar in the Palais des Festivals earlier this week. At Nike, Olander said, the products and services are becoming the marketing. That blurring of the lines, of course, is what the Titanium Lions contest was invented to recognize, and FuelBand fits the bill perfectly. Users can sync the device to a computer or mobile phone, use software to create and manage exercise goals, and upload the data to the Nike+ website—enabling a seamless, dynamic, data-heavy, self-sustaining workout routine. This creates a daily interaction with the brand that is infinitely more powerful than periodic ad campaign that culminated with a product purchase and go no further than that, Olander said. "Nike+ Running, when we did the first execution, started off as a marketing idea," he said. "It is not marketing anymore. This is how we run our business." No Integrated Grand Prix was awarded in the Titanium & Integrated Lions category. However, four other Titanium Lions were handed out tonight—to Chronic Touring for creating a virtual Tupac Shakur for the Coachella music festival; to Crispin Porter + Bogusky for the Ted Williams Fight Hunger campaign for Kraft Foods; to Lowe-SSP3 in Bogota, Colombia, for the Rivers of Light campaign for the country's Ministry of Defense; and to Dentsu in Tokyo for the Connecting Lifelines campaign for Honda. The category also awards gold, silver and bronze Lions. U.S. agencies fared well, picking up both of the golds handed out—R/GA and Nike took one in addition to the Grand Prix, and Droga5 in New York won gold for the Day One campaign for Prudential. CP+B and Digitas added a silver Lion for their Small Business Saturday campaign for American Express, which earlier this week won two Grand Prix—in Promo & Activation and Direct. Wieden + Kennedy in Portland, Ore., also won silver for the Fabio vs. Isaiah Mustafa web videos for Old Spice. In what might be seen as a bit of a disappointment, Mother in New York won bronze for Little Marina, the giant doll it created who roamed around New York Fashion Week. That campaign won Best in Show at The One Show earlier this year. A total of 19 Lions were awarded in the category. All the Titanium & Integrated winners will be posted here after 11 p.m. Cannes time (5 p.m. ET) on Saturday night.